Our School specialises in a variety of subjects in the field of music, from music psychology to composition and performance. Every year we welcome undergraduate, Masters and postgraduate researchers from across the world and we are proud of the friendly and inclusive environment that this creates. Our School has many connections with external partners in Leeds and beyond. This creates a stimulating study and research environment for our students, visiting professors and the external organisations that work with us. In 2017, we were awarded All-Steinway status, meaning that all 29 pianos housed in our School are Steinways. 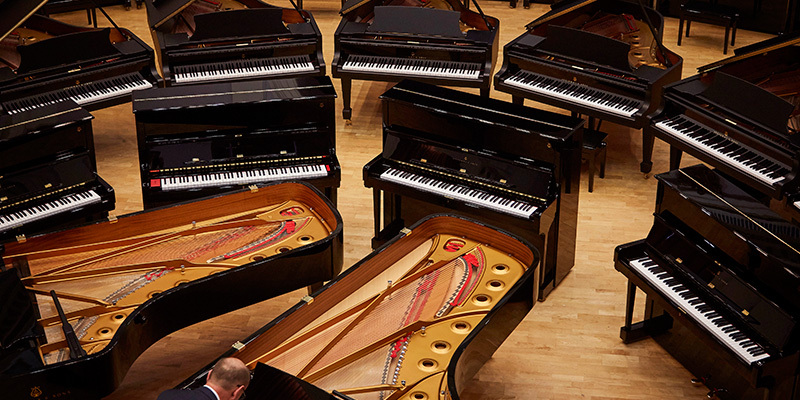 £742,000 was invested in the pianos – a combination of uprights, baby grands and concert grands. Recognition by Steinway also enhances our long-running partnership with the Leeds International Piano Competition, first held in 1963 and hosted and supported by us from the start. The School of Music is part of the Faculty of Arts, Humanities and Cultures, and this supports our interdisciplinary work with other Schools across the University and beyond. This can range from cross-disciplinary research to hosting conferences, success in league table rankings and co-delivering taught modules. Our teaching staff are highly respected in their fields and their expertise means that we can offer a range of courses, a diverse selection of modules and extensive research supervision. We have a busy events calender and you'll be encouraged to take advantage of the opportunities on offer. The University's International Concert Series organises performances year-round and all the events are free for students to attend. The School and University support the annual Leeds International Piano Competition, and events and activities organised by our students and societies, as well as external partners such as Opera North, create exciting opportunities for you to make the most of studying with us.